Inertia operated systems are historically interesting because they first appeared in the early course of the development of automatic firearms; but then were quickly forgotten for more than half a century, to reappear with great success in hunting shotguns during the 1970s and ’80s. Today, the “Inertia-driven system” is a registered trademark of the famous Italian gun making company Benelli Armi, which brought the inertia-operated shotgun back from oblivion in 1967. 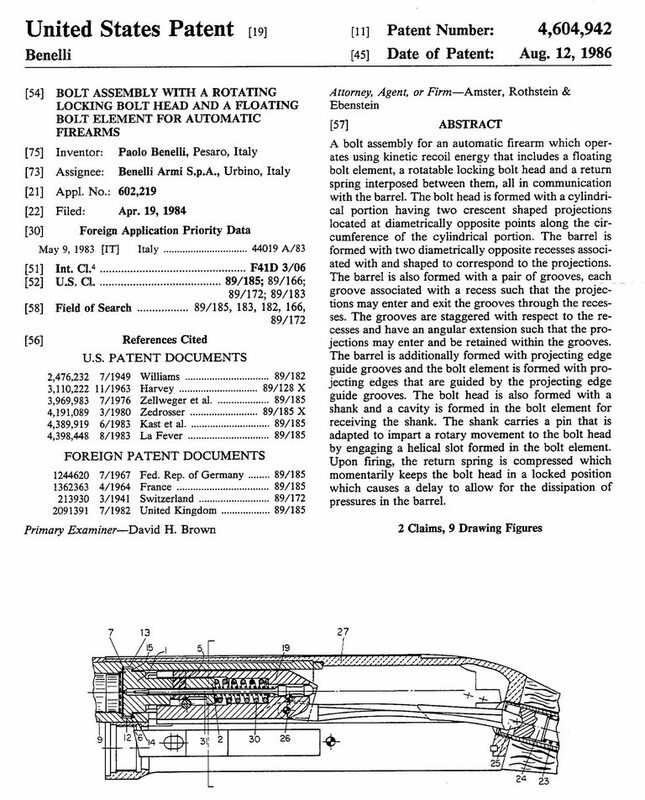 However, as many of the patents owned by Benelli have now expired, many other companies, especially in Italy and Turkey, now produce shotguns with similar systems. Let’s take a closer look at the system and its origins. Inertia is a fundamental property of every body that has mass. By physical definition, inertia is “a property of matter, by which it continues in its existing state of rest or uniform motion in a straight line, unless that state is changed by an external force”. In laymans’ terms, it’s a property that resists any change of either its static position, or linear, non-accelerated movement in space. When you fire a gun, it’s your body’s inertia that precludes your instant rearward movement under the recoil. 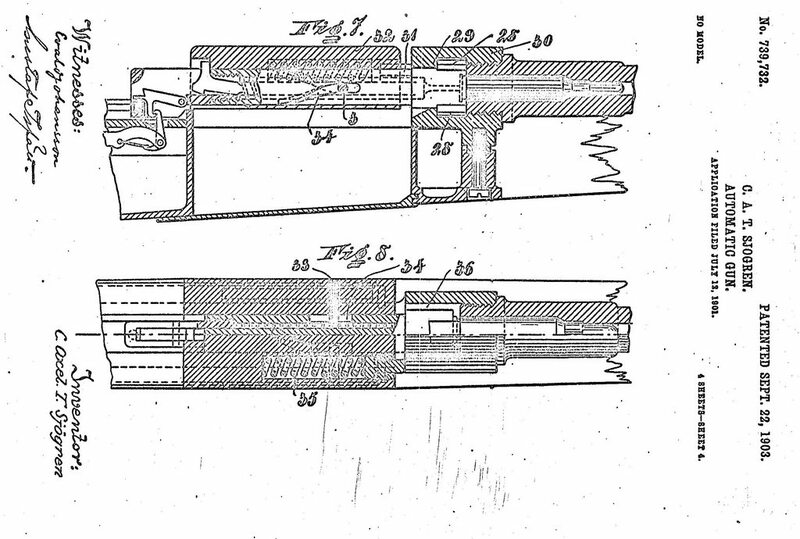 The tendency of guns to recoil upon firing was noted by gun designers quite early on, and the earliest gun-related patent of the famous British gun designer Hiram Maxim relied on the recoiling movement of the gun and the inertia of the shooter’s body to operate his semi-automatic conversion of the Winchester lever action rifle. The first inertia-operated gun in the modern sense was invented in Sweden by Carl Sjogren around the year 1900. He applied for and received several patents for his design in Sweden and abroad – describing a long gun which can be cycled automatically using a separate weight or weights that “on account of their inertia do not partake of the recoil of the gun, but, relative to the latter, so to speak, move forward”. This relative forward movement is then used to compress a heavy operating spring which, once its stored energy is sufficient to overcome the inertia of the weight, pushes it rearwards relative to the gun, thus unlocking and opening the breech, extracting and ejecting an empty shell and compressing a return spring. Sjogren then went on to design a military rifle and a hunting shotgun based on his patents. His semi-auto rifle was tested by several European armies, but was rejected everywhere. His shotgun however, was produced between 1907 and 1909 in Sweden and Dennmark. Starting in about 1908, the German company Mauser also made a foray into inertia-operated designs. Their model 1915 semi-automatic rifle, however, was not a truly “inertia operated” gun in the modern sense. This was because the inertia of the separate side was used only for unlocking the action, and the action cycle was performed under the residual pressure in the chamber. This rifle was overly complicated and not very reliable, but nonetheless it did see some military action during the Great War, mostly in the hands of German aviators (before the advent of aircraft machine guns). After the Great war most designers concentrated on more predictable and researched systems of operation, so inertia operated systems quickly became obsolete. Now fast forward to 1966. 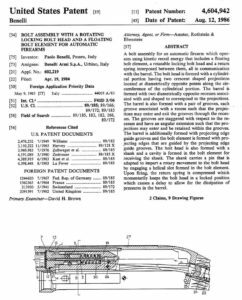 That year someone named Bruno Civolani, an Italian engineer working for Benelli Armi, applied for a patent describing an improved version of the inertia-operated system. 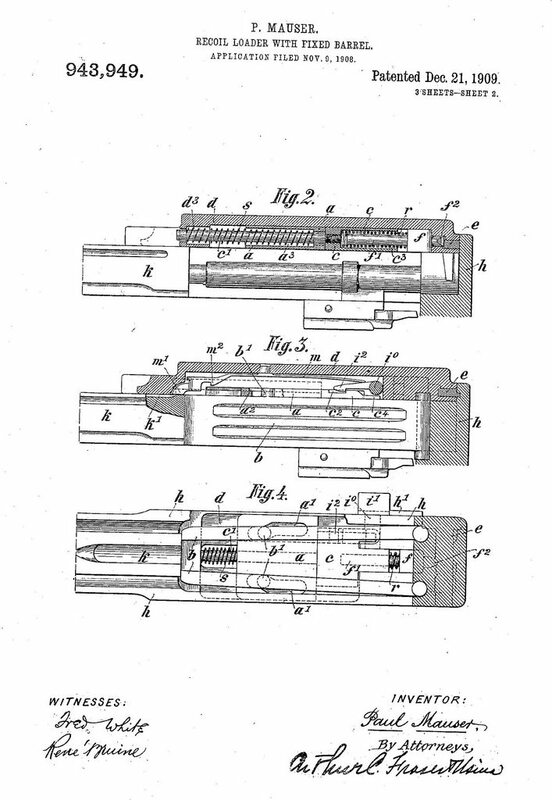 Instead of a separate “weight”, Civolani used the mass of the bolt carrier itself as an operating weight, and placed a powerful operating spring inside the carrier body, between its cavity and rotating bolt head. 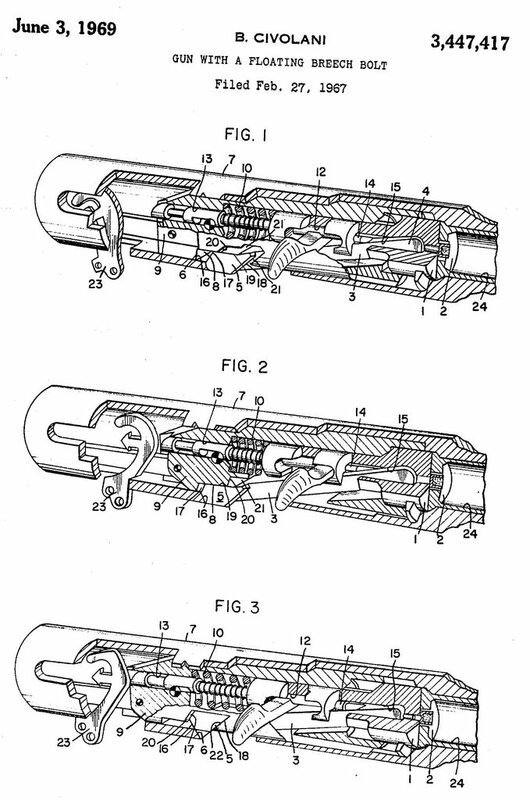 This allowed for a compact, simple and durable system, which did not require a moving barrel or a gas port (or ports). 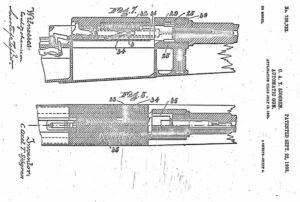 It was therefore noticeably simpler in production and maintenance than other existing semi-automatic shotgun systems. In 1968, Benelli produced its first “Inertia driven” shotgun, and by the late 1980s this system had become very famous and successful. Today Benelli produces what could be described as a second generation of their “Inertia driven” system, which they call “Inline Inertia-driven”. This system uses the same basic concept but with even more simplified maintenance and a greater range of modulations. 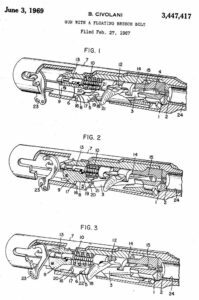 Also, because Benelli’s patents have lapsed, nowadays quite a lot of companies produce their own versions of the inertia operated designs. Until very recently though, none of these were made for any rifle caliber ammunition. This begs the question – why has noone, including Benelli itself, made a successful inertia-operated rifle over the past 50 years? Since we do not have the right answer from Benelli, we can only speculate. 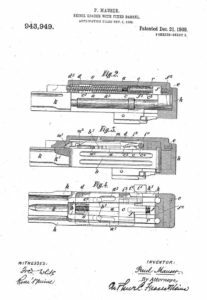 The key reason may be that typical medium-power rifle cartridges (i.e. 308 Win) produce less recoil impulse than shotgun cartridges. Probably even more importantly, this impulse is spread over a shorter period of time. Muzzle velocity for most rifle cartridges is about twice that of shotgun cartridges. Higher acceleration of the rifle recoil would then result in a higher acceleration of the operating inertia mass, that in turn would require a more powerful operating spring, resulting in a faster and more violent opening action of the bolt group. The only production rifle that sports an inertia-operated action today is the new Ukrainian XADO Snipex “Rhino hunter”, a .50BMG single-shot monster that combines a recoiling barrel (as a measure to decrease peak felt recoil) and an inertia-operated bolt group to unlock the action and extract and eject the fired case. It must be noted that this rifle is not truly a semi-automatic, as it has no magazine. A fresh cartridge has to be loaded by hand into the barrel, and then the bolt has to be closed and locked manually. This rifle is scheduled for production in Ukraine for the spring of 2017, and it is yet to be seen if it will live up to the expectation of its designers. To sum up, the Inertia-operated system has proven itself as a simple, reliable and robust action for modern hunting and sporting shotguns. For tactical and military weapons it is less than ideal because it relies on a proper grip and the recoiling of the gun against the shooters’ shoulder. Combat situations may or may not provide the necessary positions for a reliable functioning of the gun (i.e. the inertia-operated system would fail to cycle if the gun is rested against a solid and unmovable surface and thus not allowed to recoil). That’s why Benelli made the gas-operated M4 shotgun for the US military instead of using one of its inertia-operated guns like the M1 or M3. Inertia operation is also not entirely suitable for rifles due to the more rapid and violent nature of rifle recoil. However, within specified constraints this system works extremely well, and two of its most popular advantages are simplified, less time-consuming maintenance and cleaning procedures, compared to gas-operated shotguns.